Visit Kilkenny in Ireland’s Ancient East and experience the Kilkenny Cats. This superstar County Kilkenny hurling team are famed for their prowess at what is known as the “fastest game on grass”. The ancient indigenous Irish sport of hurling is thought to have been played for over 3,000 years and is now enjoyed all over the world, from North America to South Korea! You can get to grips and have a little fun yourself with the sliotar (ball) and hurley (stick) at the Kilkenny Way Ultimate Hurling Experience in Nowlan Park. You’ll huff, you’ll puff, and it’s fair to say you’ll hit a few wides… there's a bowl of Irish stew afterwards, too. It’s not just hurling that Kilkenny is famed for, either – the city is home to a well-known brew. Take a tour of the Smithwicks Experience along Kilkenny’s Medieval Mile, and learn all about an ale that dates back to 1710 (that’s older than Guinness). Travel bible Lonely Planet loved this place so much, it put it on its hottest attractions list shortly after it opened its doors to visitors in 2015. For a pub filled with medieval history, don’t miss Kyteler’s Inn. Pull up a stool within the stone-lined walls of this historic inn, and learn all about Dame Alice Kyteler, the original owner. Kyteler was accused of witchcraft in the 13th century and fled Ireland to avoid being burned at the stake after four of her husbands died in mysterious circumstances. Rumour has it her spirit still haunts the place. Drop in, and find out for yourself. To get to the heart and soul of Belfast’s shipbuilding heritage, look no further than the Titanic Quarter. Here, over a century ago the “Ship of Dreams” was envisioned, built and launched, and now Titanic Belfast – voted the world’s leading tourist attraction – unfolds its journey from conception, to tragedy and beyond. 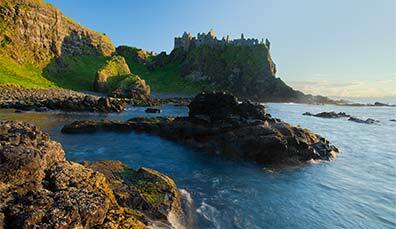 Beyond Belfast lies the Causeway Coast, whose timeless beauty and high-grade destinations are more popular than ever. Of course, beyond the buzzing metropolis of Belfast and its notable murals tours, lies a landscape filled with intriguing tales. 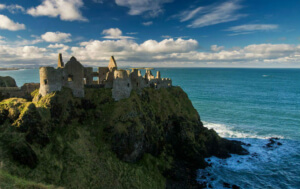 There’s the Giant’s Causeway, where giants’ stepping stones trail towards Scotland; there’s Rathlin Island, with its legend of 13th century King Robert the Bruce and the tenacity of a weary spider; and there’s the fascinating history of Dunluce Castle, where one night in the 17th century, the kitchen collapsed down a cliff into the sea. And, of course, don’t miss a sip of Bushmills Whiskey. After visiting the Old Bushmills Distillery set along the County Antrim coastline, you’ll no doubt soon be telling stories of your very own. 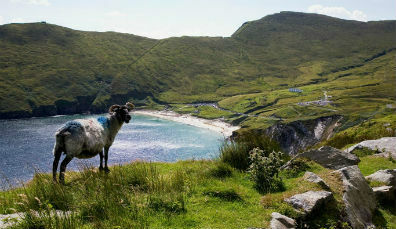 You can take your pick from Donegal to West Cork along the Wild Atlantic Way, but starting at its centre point you’ll find Connemara – with landscapes so wild and haunting that Oscar Wilde deemed them to possess a “savage beauty”. Journey by boat to the Aran Islands and cycle the boreens (country roads), or get your tongue around a “cúpla focal as Gaeilge” (a few Irish words). Irish is the first language of these isles where tradition is treasured. Perhaps stick around by booking into the Inis Meáin Restaurant & Suites for a truly elemental experience? Connemara's starkly beautiful interior is a kaleidoscope of rusty bogs, lonely valleys and shimmering black lakes. Back on the mainland, discover Ireland’s Master Bodhrán (Irish drum) Maker in Roundstone, County Galway, or indulge in seafood straight from the boats at O’Dowd’s pub. Or maybe you’d like to experience some culinary genius at Galway city’s Aniar Boutique Cookery School, run under the watchful eye of Michelin star chef JP McMahon. It’s the perfect way to learn how to recreate some of the greatest Irish dishes ever made – and a wonderful new skill to take home. Travel along the very edge of Europe with these dramatic, fun and sometimes surprising trip ideas. 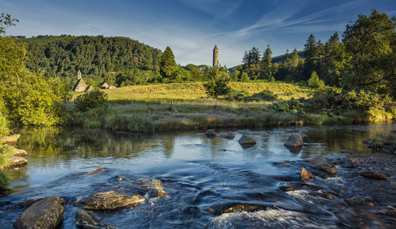 Follow in the footsteps of Vikings, saints and lords as you uncover the stories of this land. Enjoy the journey of a lifetime as you explore mountain, lakes and a truly epic coastline.